If you love to document your life, capturing important moments as fast they come, Manfrotto has a slick line-up of accessories that will take your smartphone’s camera capabilities to the next level. 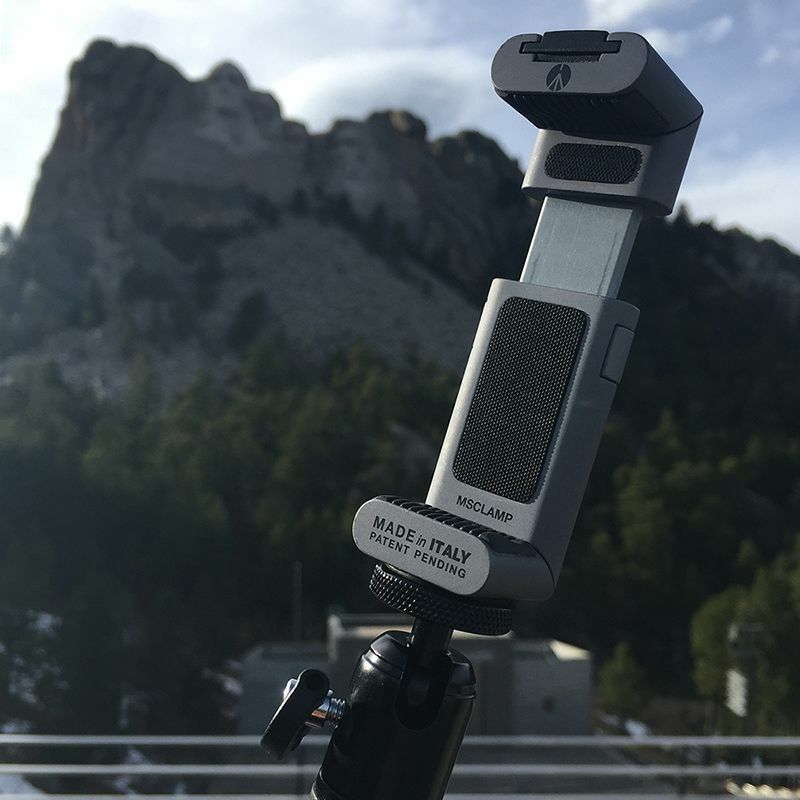 One of the latest items is the TwistGrip, a unique universal adjustable clamp that allows you to mount your smartphone to a number of accessories, such as a tripod or selfie stick. What’s most unique about the TwistGrip is its chic design. Made in Italy, the TwistGrip is constructed of aluminum and has a luxe feel in your hand. 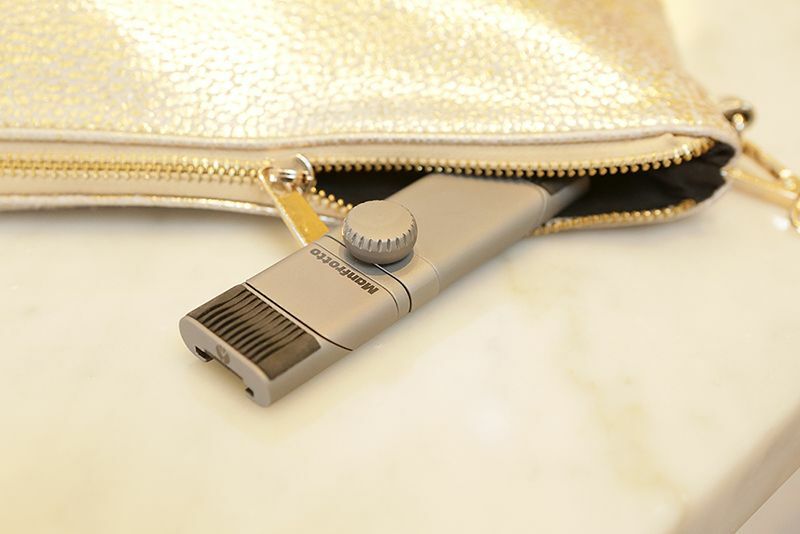 Different than other mounts, the TwistGrip starts out flat, making it easy to tuck away in your purse or pocket. The top and bottom sections come armed with contoured rubber grips that hug your smartphone, and with a simple twist on each section, you’ve got a three-dimensional camera mount. The TwistGrip can accommodate a variety of sizes of smartphones with a locking mechanism to hold everything in place. It’s also compatible with a number of fun accessories — sporting a cold-shoe mount on top (perfect for a light) and a ¼” thread on the bottom (which makes it easy to switch between accessories). Be sure to test the grip strength with your individual device for each shooting situation. Some phones and some phone cases seem to be more compatible than others — and you wouldn’t want your phone to wiggle it’s way out! 😛 I found that for more rugged expeditions, adding a Bongo Tie makes this device really ready for anything! For people who love to take selfies, the TwistGrip pairs well with the Manfrotto Compact Xtreme Black 2-in-1 (monopod + pole). I was recently on a film shoot at Mt. 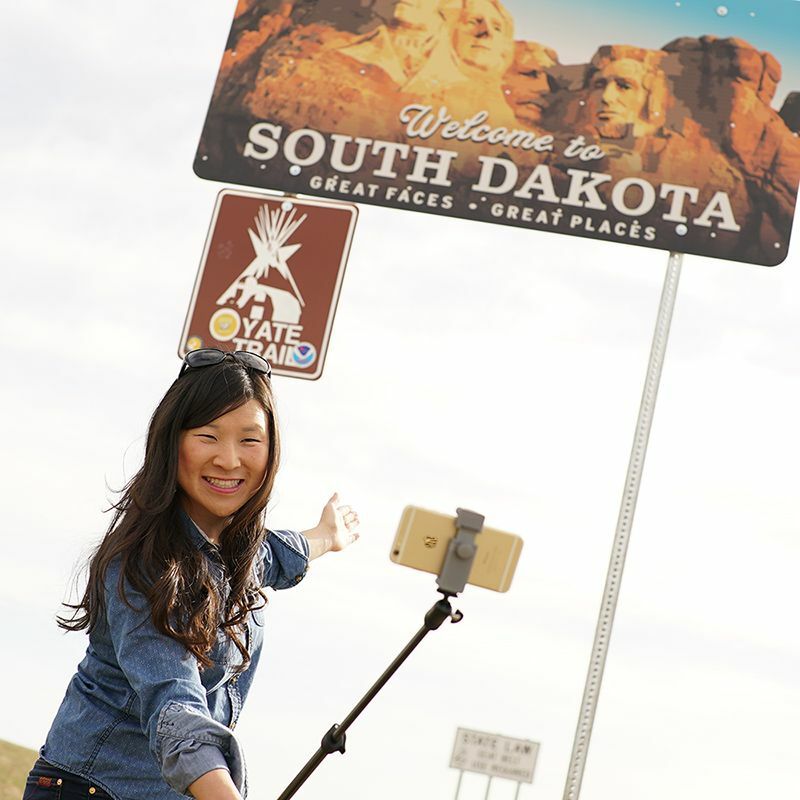 Rushmore, and our crew embraced the road trip by stopping at the South Dakota state border to take a pic. Selfie Time! 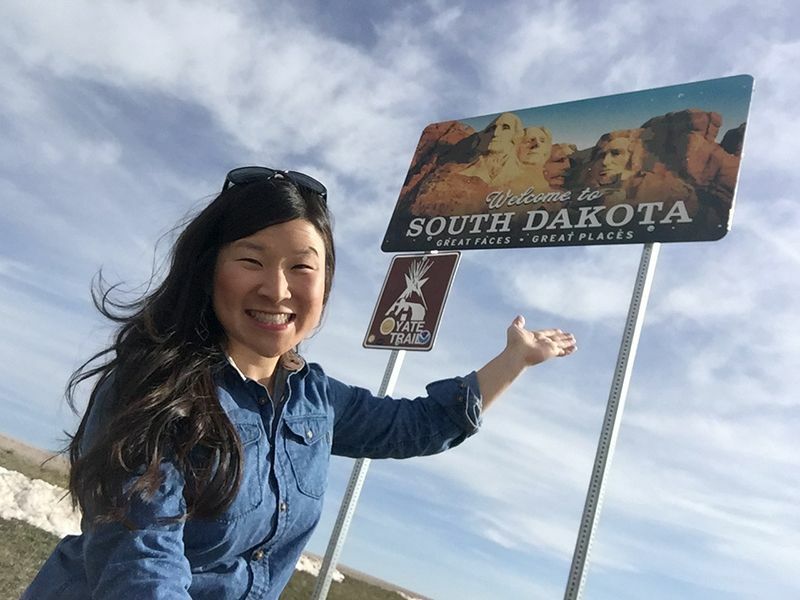 Unfortunately, taking photos in front of road signs is no small feat. The sign was so high, it was hard to frame up a good shot with the camera at an arms length. But, my fancy Manfrotto selfie stick worked like a charm. The Compact Xtreme has a comfy handgrip with three telescoping sections that offer a lot of length! The locking mechanisms provide a sturdy hold that is easy to adjust, far superior to competing items in the marketplace. The ball head made it easy to angle the camera at just the right position — which also made shooting creatively at high and low angles a breeze. 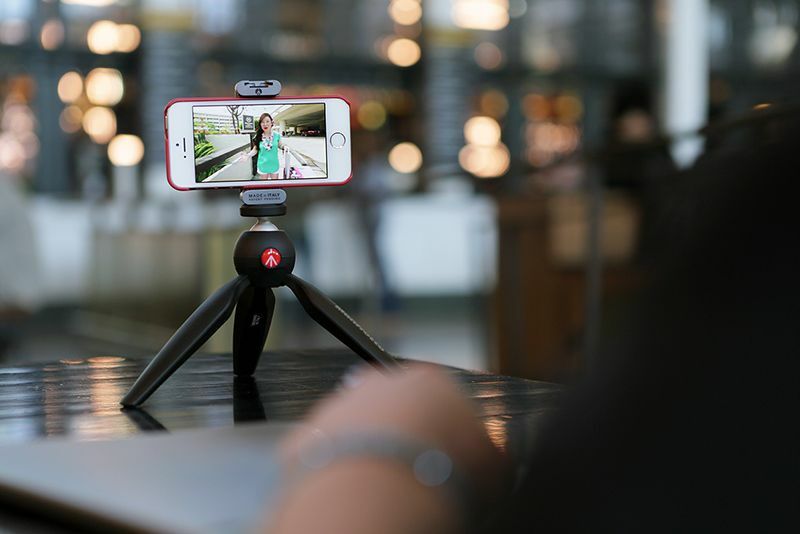 One of the best ways to use the TwistGrip is to pair it with the Manfrotto PIXI to watch videos on the go. This mini tripod is super compact and portable, an easy item to keep by your side. The ball head makes it easy to adjust the tilt of the screen with the push of a button. 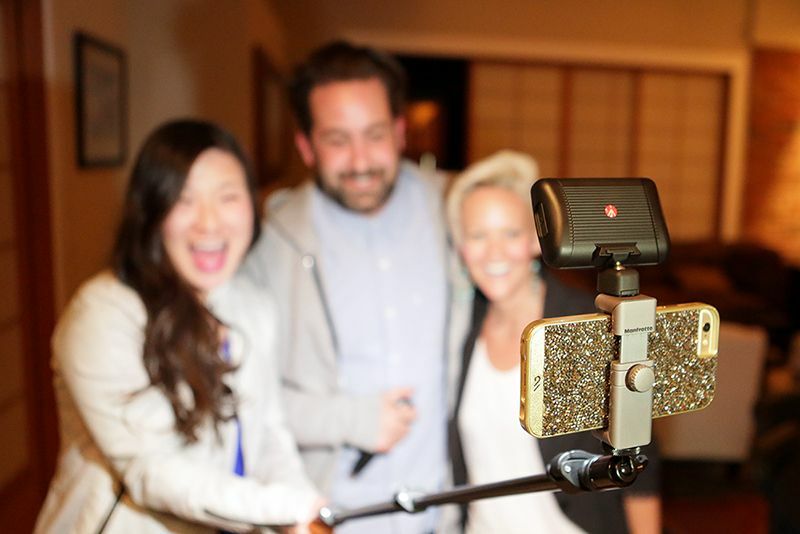 I also use the Manfrotto PIXI like a mini-selfie stick, collapsing the legs into one super grip. It gives me just a bit more length to make up for short arms, helping me avoid super close close-ups! 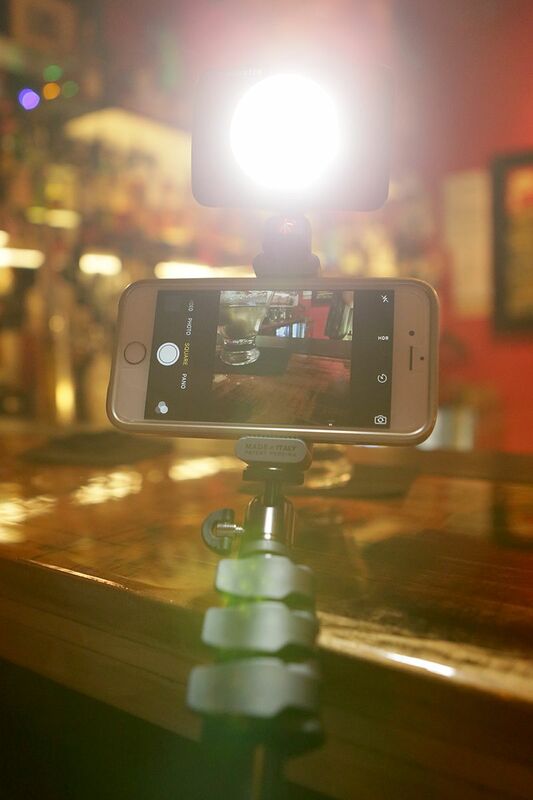 Another unique feature of the TwistGrip is the cold shoe mount on top — which allows for the option to add a light. The Manfrotto Lumimuse 8 LED Light is a great tool to have in your back pocket for photo or video. I’m impressed with the light output, especially given its size and weight! Thanks to its small ball head, it’s easy to point the light in the right direction. While there isn’t a way to tighten or lock the light in the shoe mount, it has a firm grip—so that light’s not going anywhere. The Lumimuse 8 also comes with a diffuser, CTO and ¼ CTO gel which mounts directly onto the light. Since most front-facing smartphone cameras don’t have a flash or continuous light, the Lumimuse 8 really gives selfie photos and videos a boost. Party pics from dimly lit bars and harsh shadows on sunny days will be much improved. The continuous light is also generally useful for people who focus on shooting video with their smartphone. All in all, the Manfrotto TwistGrip is one of a kind. It’s portable, versatile and stylish. 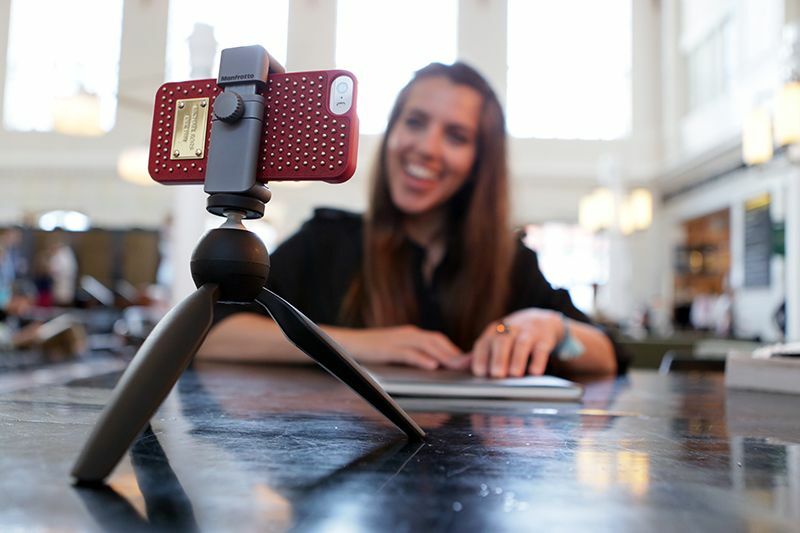 Paired with other accessories, the TwistGrip allows smartphone users the ability to shoot photos and videos creatively and independently. Just make sure you have a good grip, and you’re ready to go!